February has been a busy month in the studio, but finally, I have the latest Stitchwerx Designs pattern in the shop! 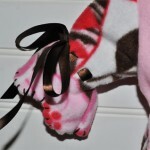 This one is a comfy, easy-to-make fleece dress for small dogs. 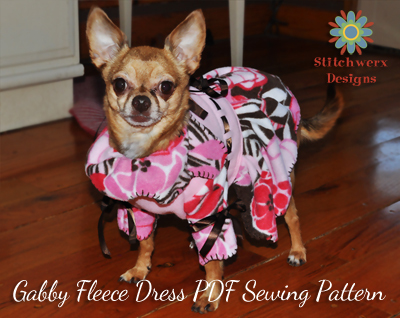 Like all my dog clothes patterns the Gabby S208 Fleece Dress is a digital PDF pattern that includes 5 sizes. 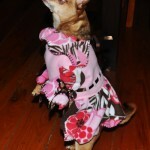 I love to name my patterns after my models and this pattern was named for Gabby, a sweet, rescued chihuahua. 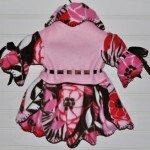 She was a marvelous model in her comfy, pink and brown floral fleece dress. The design process can be tedious at times, but I enjoy every aspect from sketching to drafting to sewing prototypes. Of course, there is always some “tweaking” involved to get the design and fit just right. My dogs are usually the recipients of my not-quite-perfect prototypes, but they don’t seem to mind if they end up with revision number 3 instead of the final product. They just like having something to keep them warm when we go outside in the mid-February chill! With spring approaching, I’m planning to switch gears and work on some “people projects” for a while. The dogs may not like it, but after watching so much Downton Abbey, I’ve been inspired to sketch some new (but vintage style) hats! Several are in the early stages, so I’ll have to see how long it takes me to get them to completed patterns. In the meantime, drop by the Stitchwerx Designs Etsy Shop and save on all my patterns including the latest, Gabby Fleece Dress pattern S208. 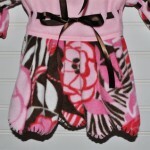 Use coupon code Gabby10 and get 10% off all store patterns through February 28, 2013. Thanks for stopping by and Happy Stitching! 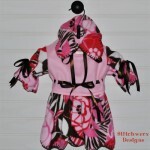 This entry was posted in Dog Clothes Patterns, Dogs, Sewing, Sewing Patterns and tagged dog clothes, dog clothes patterns, dog clothes sewing patterns, dog dress pattern, fleece for dogs, sew dog clothes, sewing for dogs. Bookmark the permalink. I clicked on your little girl at Chic and Crafty and was sad to see you only showed a pattern for a wee one. We have 3 standard poodles and while I can sew, getting them to hold still for measuring for a pattern would not be easy, I can’t do it at all, at least without assistance. I don’t get that, even though it would make them easier to clean snow off. The guys do that so you’d think…but no. Thanks. My largest size pattern fits a dog girth between 17-19″. It is really hard to do sizes larger than that in PDF files because the page size is 8.5 x 11. All the pattern pieces have to be sectioned to fit on that size page. Larger sizes with big pattern pieces make the files too large and it can be quite cumbersome to piece all those sections together! Sorry! This is so cute. I’m following you via Pintrest. I host Fluster Creative Muster Party on Wednesdays and I would love it if you would come by and party with us. Hope to see you there!